The megastore is spread over 12,000 sq ft area. 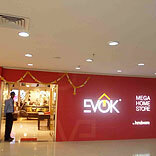 EVOK, the speciality home interiors retail chain of Hindware, has now opened its all new megastore at Malhar Mega Mall, Indore. The launch of the new megastore is part of Rs 250 crore investment plan of the company and its vision to become the ‘first choice partners’ of Home Interior solutions for customers in India. The store is spread over 12,000 sq ft area and will offer over 16,000-plus world-class contemporary lifestyle products across categories like Home Furniture, Soft Furnishings, Home Décor & Accessories, Modular Kitchens, Laminated Floorings, Bath and Lightings. The retail arm will soon to roll out more such megastores in key south and west Indian cities like Chennai, Coimbatore, Vizag, Noida, Mumbai, Ahemdabad and others. The company will add another 8-10 Mega Home Stores by the end of 2012, continuing its expansion focus in tier I and tier II cities.